Check out our great rates.... Enjoy a holiday despite the credit crunch! 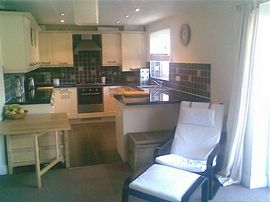 This luxury apartment is the perfect place to enjoy your holiday in Porthtowan. 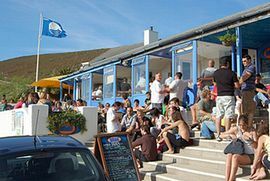 The village offers a charming blue flag beach with great surf framed by coastal views and breathtaking cliff-top walks. All within two minutes walk from the door. 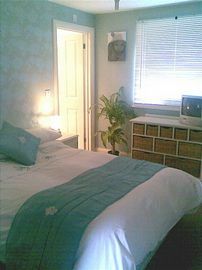 There are two lovely bedrooms, one double en-suite and one twin room. A family bathroom and open plan lounge/kitchen. From here you can see right out over the sea to the horizon. The kitchen is fitted with all essential appliances and some added extras to make your time here more relaxing! (dishwasher/washer-dryer/bread maker). In the lounge we have free WiFi access, phone connection for emergency and incoming calls and SKY PLUS television. For families with young children we can supply a cot and highchair. The flat is adjacent to a lovely play park and there are more facilities in the village. The apartment is no smoking. With it's stylish interior and great facilities all you need to think about is enjoying your relaxing stay! Luxury Apartment with great facilities. Local Services: there are various local bars and places to eat, a local store, post office and phone box. Take the 3rd exit toward St Agnes (B3277) Turn left at Sevenmilestone garage toward Porthtowan. Just past Avalon Tea Rooms on your left, Turn Right into Beach Road. Once in the village go past the pub and turn right just before the car park. The cove is at the very top of the road. Apartment nine is on the left. 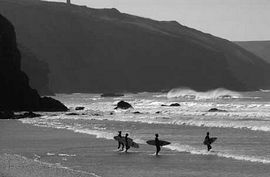 Truro or Redruth are the closest stations with good links to Porthtowan during the day. Taxi's from Truro will cost about £20.00 Redruth about £15.00. 2011 Tarriffs - Saturday to Saturday. May/ June: £495.00 per week. Short stays will be considered, please ask. Available 1st April 2009 until October.